The Post Redirect connector is quite similar to the HTTPS Connector. While the HTTPS Connector allows you to forward submitted data through the server, the Post Redirect Connector allows you to forward submitted data from FormAssembly to any remote service through the browser. When using the Post Redirect connector, data is sent as application/x-www-form-urlencoded data. The Post Redirect connector currently cannot pass data as JSON content, only as form encoded data. You need to use a third-party service that normally takes its inputs from a web form. Perhaps you're replacing the form and need to maintain the existing process, or maybe you're just adding another process to your work flow. FormAssembly will act as the "middleman," processing your form and delivering all its advanced features, and then forwarding the data. You need to enforce some sort of validation on your form data that isn't provided by FormAssembly. Using a custom-built script, you could take the submitted data, check it against your own validation rules, and if needed, prevent the submission and redirect the respondent to the form with the appropriate error message. The Post Redirect Connector is available on FormAssembly's Professional, Premier, and Enterprise Plans. 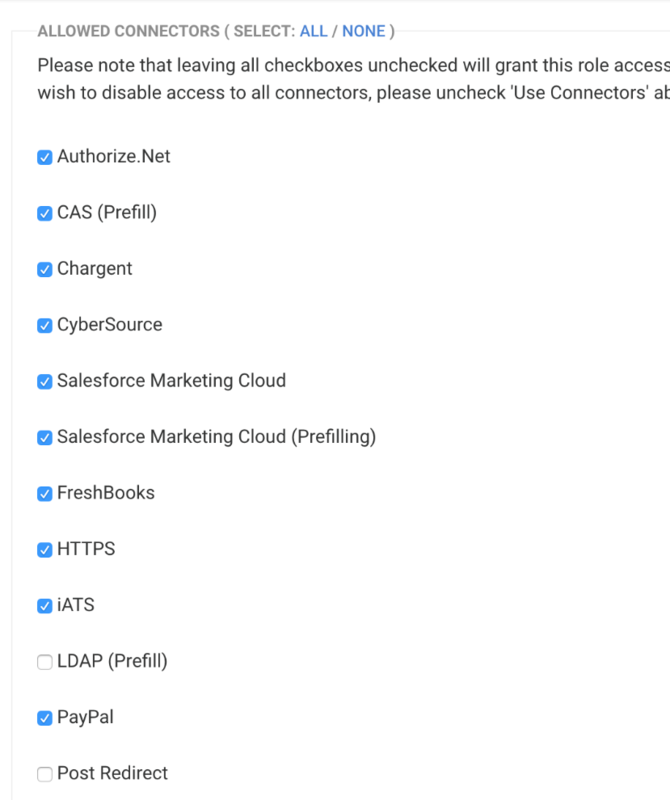 By default, the Post Redirect Connector is disabled for Enterprise and Compliance Cloud customers. This can be enabled by an Administrator. Note: The Post Redirect connector cannot be used for processing payments or for sending sensitive data through the connector. Instead, please use one of our Payment Connectors. Additionally, we enforce modern SSL TLS 1.2/HTTPS protocols for the HTTPS connector. Provide the address (URL) of the script that will process the data. If needed, you can also enter a username and password (RFC 2617 Basic HTTP Authentication). The success of the remote script execution is determined by the HTTP Status code returned. At this time, HTTP 2xx codes (200 to 206) are considered success, and HTTP 4xx and 5xx are considered failures. Other status codes, such as 3xx redirects, are ignored. Finding the remote script URL will be different depending on where you are attempting to send data. In general, you'll want to visit the destination website (i.e. where you are trying to send the data), right click on the form or data entry portion of that page, and click view source. Next, you'll want to use your browser's Find command (usually ctrl+f or cmd+f) and search for "action=" without the quotation marks. Once you've found that, you'll want to copy the value that is after the equals sign, and use that as your remote script URL. If you run into any trouble with this, please contact our support team and we'll be happy to help! The purpose of the field mapping process is to specify what information should be sent and how it should be identified. The Post Redirect Connector lists the fields present in your form with their default field name. You can edit the field names to match the names expected by your remote script. You can also enter additional fields with fixed values as needed. Please Note: Files cannot be sent or uploaded via the Post Redirect Connector. The connector's activity log is particularly useful to troubleshoot configuration problems with your connector. To access it, go to the Connectors page for the desired form and click on log link for the Post Redirect Connector. We have 2 examples HTTPS Connector setups you can take a look at. These setups follow a similar setup as the Post Redirect Connector.